August | 2012 | mmmmbike! The more randonneurs I meet, the less it seems like any has an exact age. Some seem wise far beyond their years, others are many years young. So it may be a little ironic that this month’s ride falls so close to my birthday. My role model in life is the French lady who lived well into her centièmes, eating chocolat, drinking le vin du pays, and riding her vélo every day… so each birthday brings me closer to this goal, right? There is some cause for celebration in that. And riding on (the day after) my birthday had some major perks, especially since it was a fun, social, and well- organized ride like the Santa Cruz Randonneurs Dart. I knew I wanted to team up with Ely for this event, since I had ridden with him several times before and knew we could ride together well. I had no idea what was involved in putting a team together, but I figured since the ride was scheduled for the day after my birthday, I had to do whatever it took! Fortunately, a far more experienced individual offered to pick up the slack for me, someone who (like me) happens to enjoy a Pelican (or three?) as much as or more than anyone…the illustrious and jolly John Potis. I knew right away when John volunteered to captain that we would have a terrific time. And we did! 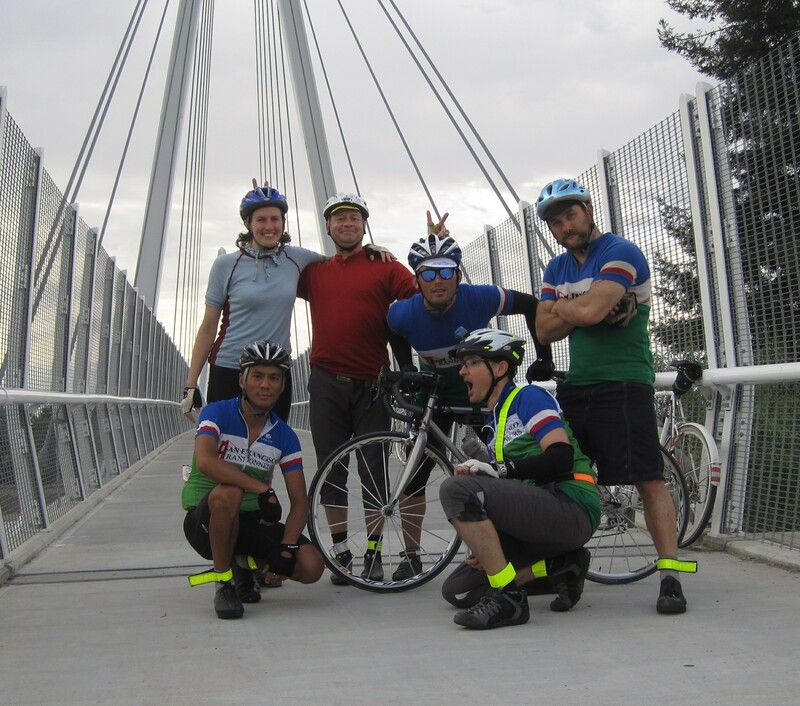 The high point of the ride for me was when we arrived in Los Gatos and my brother and my soon-to-be sister-in-law, who just happened to be in Los Gatos that weekend, met our team at Great Bear Coffee. The piece of chocolate cake I got out of the deal was certainly not unwelcome, either… thanks, brother Scott!! Did I mention that other perk of riding on my birthday: everybody kept buying me food! The captain picked up my chicken pot pie at the Ugly Mug, Jim got my sandwich at Arcangeli’s, and then of course SCR provided meals for everyone at the finish, where John bought everyone on our team a beer… what more could a randonneuse ask for, really? Or a nice team photo? The dinner at the Tied House was really touching, since Scott Brittle had hired fellow randonneuse Alice Stribling to design a poster for the event, and we all got to sign the mat it was mounted in. I did not realize that SCR was picking up the cost of dinner for everybody, a generous act I’m sure we all appreciated. SCR also provided monitored bike parking for us– a couple of young people hanging out in deck chairs watching over all our bikes in downtown Mountain View! Adorable. A hard workout it surely wasn’t… Well, maybe I will make up for it next month. I did get a little sprinting in when I raced to chase down our teammate Jim, who got lost in the moment riding too far off the front and missed a turn. 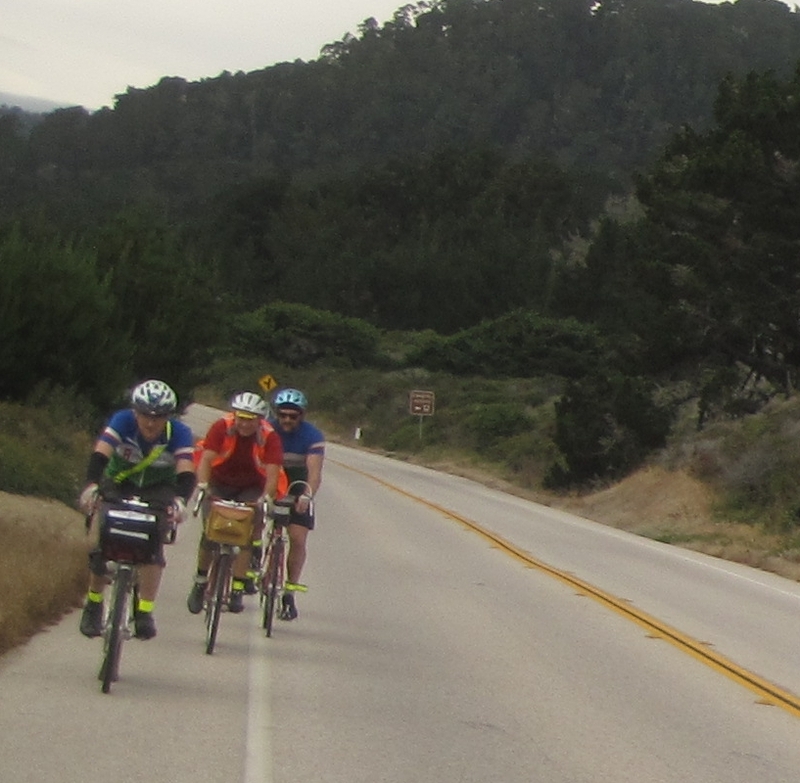 Interestingly enough, the SFR skills class in group riding was scheduled for the following weekend, something I probably could have used before this ride as I’m sure my cycling manners could stand to step up a bit. John was a great captain, though, and kept us all together and on schedule. I’m not sure yet what September has in store for me. Davis night 200K? Marin Mountains? SCR 400K? Sanfranciscadero permanent? The next full moon is on September 30– perhaps a moonlit permanent? There are too many enticing possibilities for delicious bike riding– I want to do them all, but because of work and other responsibilities, I have to choose just one. See which one I pick in the next exciting installment of mmmmbike!